How do you keep beer in top condition? We probably needed to find out. Cask Marque, the pub accreditation scheme, offers a one day 'cellar management course'. It seemed a good starting point, not least because it was held in a brewery. The four of us therefore found ourselves one Wednesday in November heading west to Chiswick, Fuller's Griffin brewery our home for the day. On arrival we were directed to the 'Centre of Excellence'. The room lived up to its title. It was effectively a micropub itself with a fully stocked bar and seating for around 20 people. If we could transport this to Camberwell we would be more than happy. First order of the day though was a tour of the brewery, a very civilised start to proceedings. Together with our classmates, we trooped around the old and new parts (a nice touch that the defunct 19th and 20th century equipment had been left in place alongside the shiny stainless steel new kit), hearing tales about characters such as 'Alan the Gallon', a brewery worker famous for drinking beer direct from the old open fermenters. We hope he retired to Camberwell. Back in the Centre of Excellence it was time for everyone to introduce themselves. The other attendees ranged from bar staff and hotel managers to two mates who were setting up a business to sell pre-mixed cocktails in kegs. You won't be finding them on sale in the Camberwell Shark but we wish them luck. Everyone was asked to reveal what their favourite drink was. Only three out of the 16 attendees listed a beer, a slight surprise given why we were there (Stockers raised eyebrows when he plumped for whisky, while unnecessary mirth resulted from my pick of dark mild). It was finally time to do some work. The first session was about beer quality and serving the perfect pint. Cask beer should be served at 11 to 13 degrees and sold within three days once tapped; keg beer should be served at 5 to 8 degrees and sold within five days once tapped. 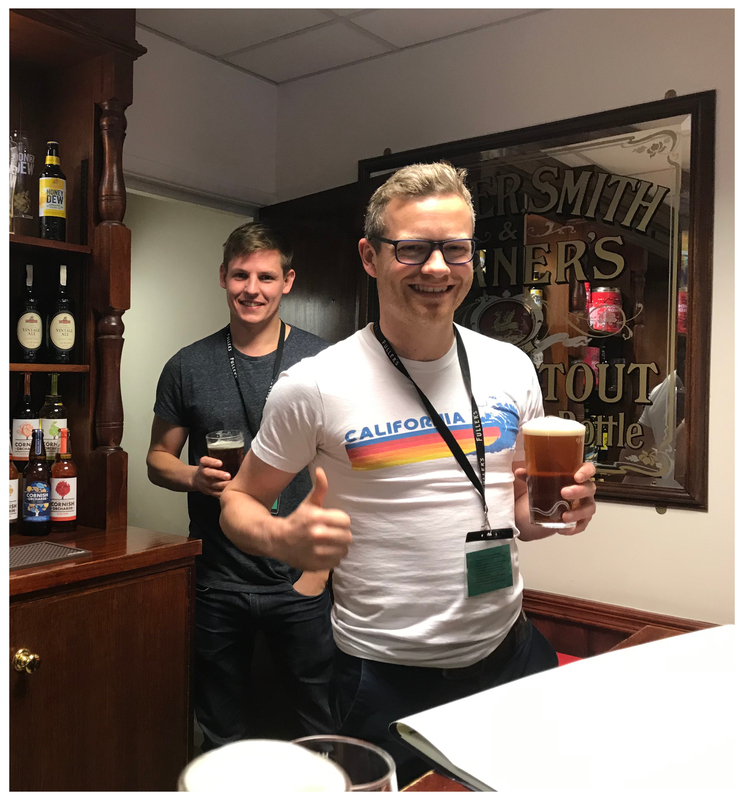 The trainer was also a Cask Marque inspector and our stomachs all turned when he said he'd been served a pint this summer that was 30 (THIRTY) degrees. The definition of a crime against humanity perhaps requires expansion. This year's Cask Report from Cask Marque made pretty grim reading for cask beer drinkers with 69 per cent of pubs serving beer over 13 degrees during the hot summer months, and casks on sale typically for seven days or more. We resolved to make sure our cellar would be able to cope with any future heatwave and that once beer was past its best, it wouldn't be sold. 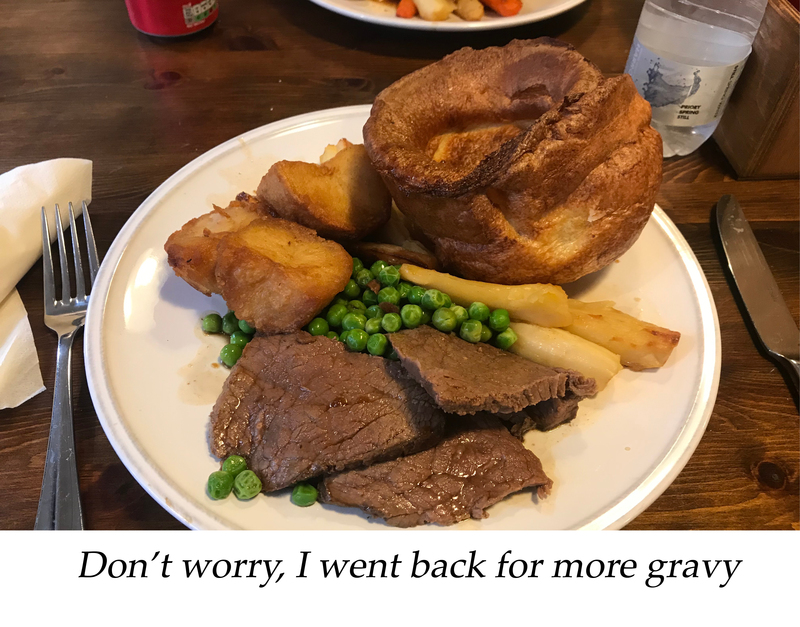 And with that it was time for lunch, the brewery's canteen doing a fine roast dinner (free for us but only £3.20 for the brewery workers, what a place to work). "Ah sod this, let's have a pint"
The brewery had provided a cask of Bengal Lancer in the cellar. It wasn't connected so a good opportunity for some hands-on training in the cellar room. I must have looked thirsty as I was offered the first pint straight from the cask in the cellar. At 5%, highly recommended to ease yourself in to any training course. The trainer declared it a free bar. We could help ourselves to anything whenever we fancied. The rest of the afternoon therefore passed by very convivially as we alternated between practical demonstrations on cleaning lines and tapping casks in the cellar, and a good sit down with freshly poured pints in the bar classroom where the trainer held court. My favourite story was a bar at Manchester Airport where the bar was air side but the cellar land side, bar staff having to go through security each time they changed a barrel (the lines were that long they held twenty pints). 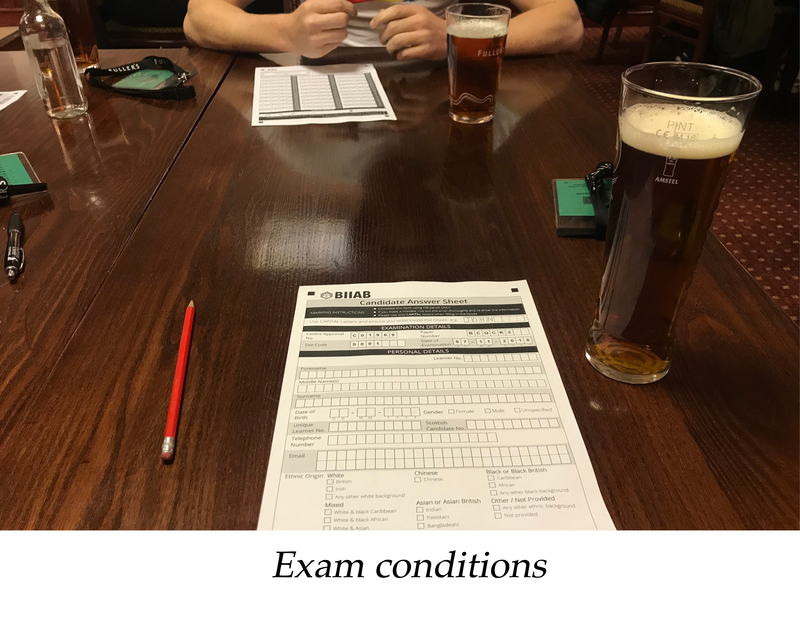 Amidst the free flowing beer, we'd forgotten there was an exam at the end of the day and a qualification to achieve. But after a quick top up, we were pretty confident. First to finish, I was perhaps too confident. 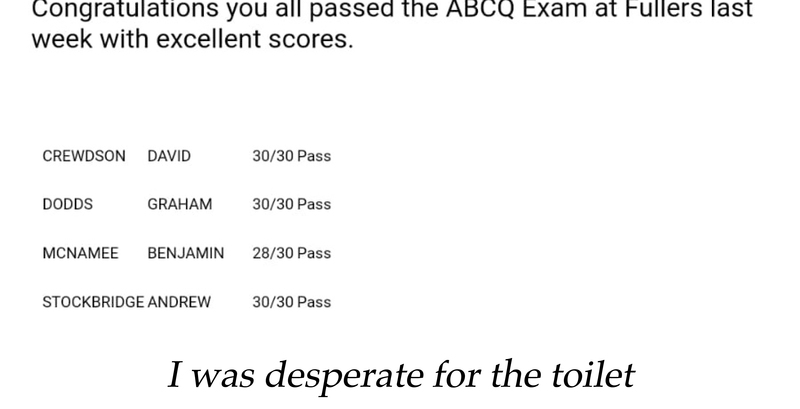 But with a pass mark of 23, we now all have the equivalent of a GCSE in managing cellars. That wasn't the end of the fun though as there was time remaining to make full use of the free bar. The instruction to help ourselves included the fully stocked fridge in which I'd spied a bottle of Fuller's 2007 Vintage Ale. We were apprenhensive about cracking it open straight from the fridge given the focus on serving temperature throughout the day but the trainer took the decision for us ("it'll warm up in your hands"). 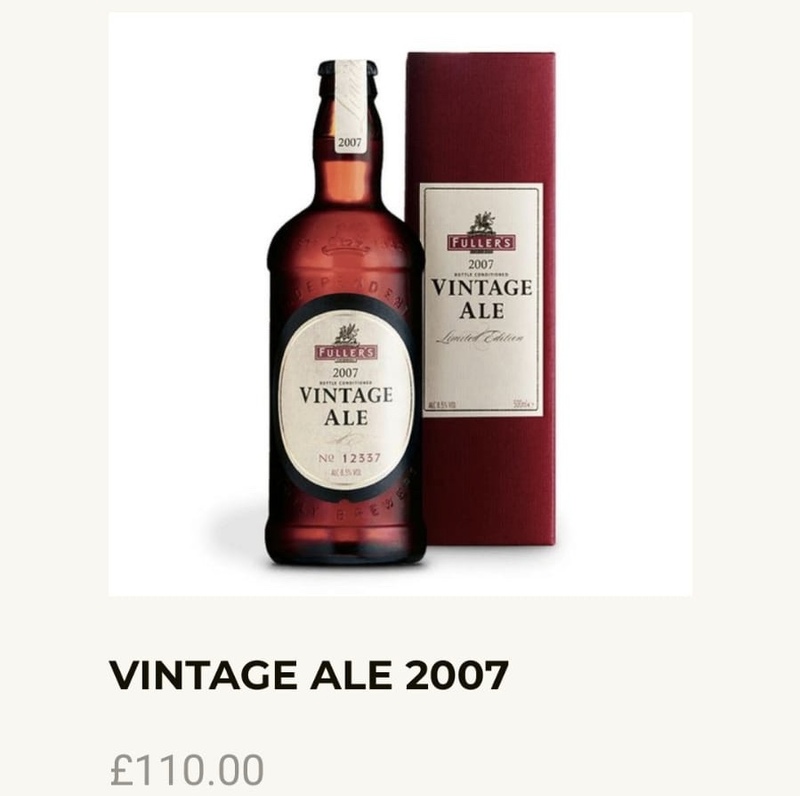 On the way out we popped into the brewery shop where we found 2007 Vintage Ale for sale. Dave and Dodds departed but me and Stockers, together with two classmates from the course, popped in for one at the Mawson Arms, the pub on the brewery site. Last orders were called at 8pm and I had a bit of time before I was due to meet my girlfriend at Heathrow, so took the sensible option of proposing an Uber to the Fox & Hounds in Sloane Square where one of our new friends worked. Unfortuantely Liz's flight landed early but it worked out well in the end. We all declared it one of our best ever days out. 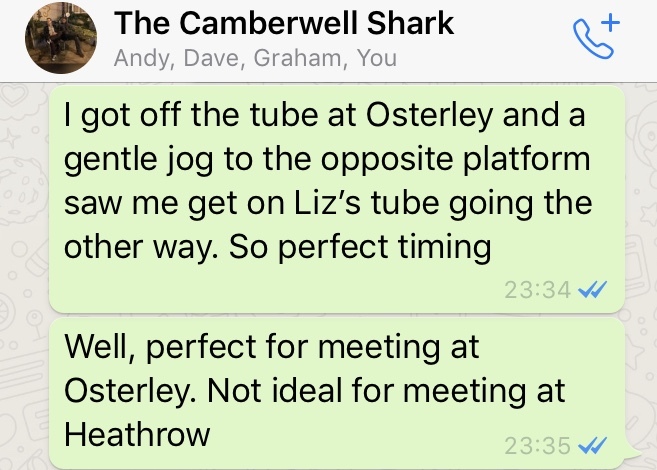 If you have a spare £110, or even better, find a premise to persuade your employer to send you, you'll (probably) have the time of your life in the company of Cask Marque at Fuller's. I'd happily go every week. We begin to check out possible suppliers with a Saturday trek around some of South London's finest brewery taprooms (and bins).